Sadly the Seedpod is no longer available. 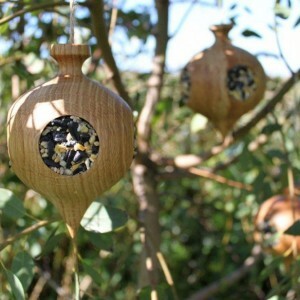 Turned in Ireland from native Irish hardwood, every Seedpod Bird Feeder is individual. The Seedpod is the first product by Quercus. 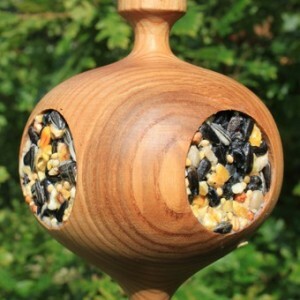 It was designed as a safer and more attractive way of feeding garden birds the high energy fat and seed mix they need to get them through the long winters. 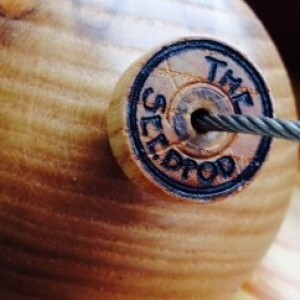 The Seedpod comes ready filled with a high quality seed mix as recommended by the RSPB. You can refill them yourself using our recipe for seedcake, a commercially available fat ball, or your own individual mixture tailored to your own garden birds. Remember, free shipping for all orders over €100 within Ireland and the EU. Shipping outside the EU? Your SEEDPOD is designed to be hung either singly or in groups from trees and shrubs or from any likely spot that can be readily seen by you. Remember to hang it out of reach of cats and other dangers! Being made from wood, rain and sunlight will act together to turn it to a characteristic dark silver colour over time. In case you prefer to keep it looking like new, we have treated it with a special oil which will protect it for a short while. Your SEEDPOD will be simpler to re-fill if you can get it down easily. Birds will often take a few days to notice a new feeder.